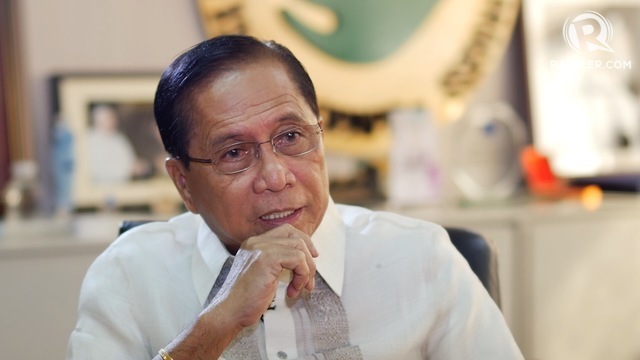 Chief Peace Adviser Jesus Dureza supports a third extension of martial law, saying it could help ensure a peaceful and successful plebiscite on the Bangsamoro Organic Law in January 2019. "I-extend muna (Extend it first) in order that the climate also be conducive to a peaceful plebiscite and perhaps a peaceful election in May," he said on Wednesday, November 14, during a Rappler Talk interview. "It can help, definitely, in the areas now. You know that some areas in Mindanao are problematic," he added. A regional plebiscite on the BOL is set to take place on January 21, 2019. On this day, residents of the core territories of the Autonomous Region in Muslim Mindanao will vote for or against ratifying the BOL, which will abolish the ARMM and replace it with the Bangsamoro Autonomous Region in Muslim Mindanao (BARMM). BARMM will have greater political and fiscal autonomy than ARMM thanks to the BOL passed by Congress and signed by President Rodrigo Duterte in July. Martial law in Mindanao is set to end on December 31. There are talks that, while the timeframe for military rule could be extended, its geographic scope could be decreased. Dureza does not agree with limiting martial law to only certain parts of Mindanao, fearing it would just shift violence to vulnerable areas. "That could be possible but the problem there is if you limit martial law to a certain area and there's none in another area, then those trying to foment chaos will go there, in the area without martial law," said the presidential adviser. "You create pockets of more conflict and more destabilization and the feeling of insecurity among the people, because you will only select [some areas]," he said in a mix of English and Filipino. Dureza is convinced most Mindanaoans want an extension. "What I'm getting from ordinary citizens who I go with and talk to is they prefer to extend martial law... At this point in time, there is still popular clamor," he said. If martial law is extended anew in late December, it will be the third extension. The first extension, for 5 months or until December 2017, was granted some two months after Duterte first proclaimed martial law in Mindanao due to the Marawi siege. The second extension was granted in December 2017, this time allowing martial law to last for a year or until this December. Dureza is the third Cabinet member to express support for another martial law extension. Executive Secretary Salvador Medialdea and Chief Presidential Counsel and Presidential Spokesperson Salvador Panelo held similar views. The Philippine National Police is also set to recommend an extension.